ENR’=ENR-A dB where A is the attenuation in dB. The property can be used to obtain a different ENR from the noise source, a different Thot. A known noise source can be used with a known attenuator to provide two different input conditions for measurement of a Y factor and calculation of NF. The variation here is that the noise source is on for both halves of the test, and the applicable source noise temperature needs to be entered into NFM. Lets explain using an example. Lets take a noise source of ENR=50dB, and 40dB and 50dB attenuators. 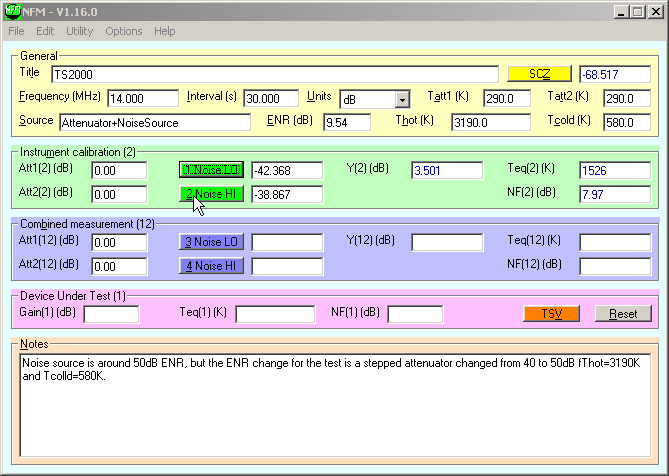 set ENR to 10dB (50-40) and a new value of Thot is calculated (3190.0). NFM will try to calculate NF. Above, the NFM screen showing such a measurement. Duffy, O. 2007. Noise Figure Meter. https://owenduffy.net/software/nfm/index.htm. ———. 2004. 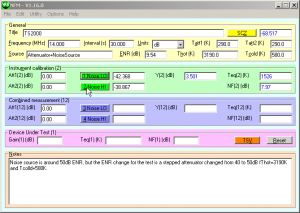 Noise Figure Y factor method calculator. VK1OD.net (offline).